For the 24 hours to 23:00 GMT, the GBP declined 0.12% against the USD and closed at 1.2935 on Friday. In the Asian session, at GMT0400, the pair is trading at 1.2929, with the GBP trading 0.05% lower against the USD from Friday’s close. 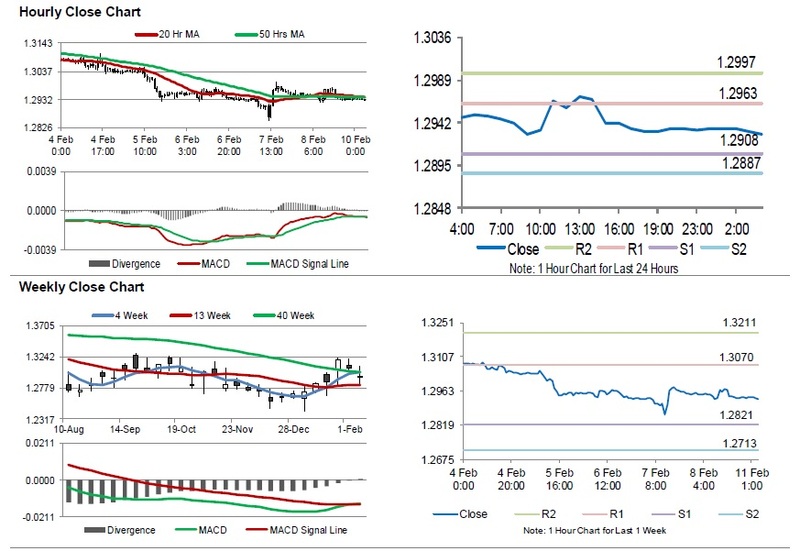 The pair is expected to find support at 1.2908, and a fall through could take it to the next support level of 1.2887. The pair is expected to find its first resistance at 1.2963, and a rise through could take it to the next resistance level of 1.2997. Looking ahead, traders would keep an eye on Britain’s 4Q gross domestic product along with trade balance, industrial production, manufacturing production and construction output, all for December, slated to release in a few hours.